Kaleidescape M700 Disc Vault stores 320 discs | What Hi-Fi? 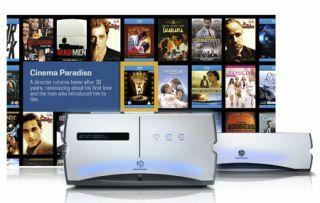 Kaleidescape, the upmarket manufacturer of multiroom home entertainment systems, has introduced its M700 Disc Vault, designed to upload and store up to 320 Blu-ray, DVD and CD discs. It incorporates an integrated M-Class player, and can be linked with Kaleidescape servers to distribute audio and video around the home. The M700 includes a speed reader for copying discs on to a server. It loads a single Blu-ray disc in 30 minutes, while three DVDs and around 15 CDs can be uploaded in an hour. Once the discs gave been copied to the Kaleidescape system DVDs or CDs can be removed from the M700 Vault, or left in it for storage. Blu-rays must remain in the vault to enable playback of the digital copy from the server. In the UK, the Kaleidescape M700 Vault Disc will sell for £4495 plus VAT. Paired with a Kaleidescape 1U server, a complete system will cost £12,190 plus VAT.